Vice President Mike Pence, who's in South Korea for the Olympics, has promised a new round of tough sanctions on North Korea. But while the U.S. is downplaying the Olympics as a possible starting point for a new round of negotiations with North Korea, South Korea is openly stating its plan to use the Olympics to re-start talks, according to the Washington Post. Why it matters: Beijing wants to put stress on the U.S.-South Korea alliance and restart talks with North Korea that will reduce the near-term risks of conflict on the peninsula. 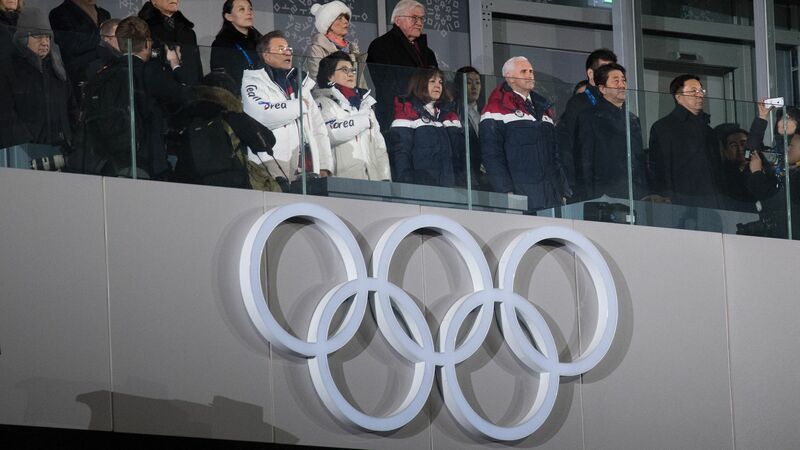 What's happening: WashPost's Josh Rogin, traveling with Pence who's in South Korea as the senior U.S. representative at the opening ceremony of the Winter Olympics, reports that the U.S. and South Korea now openly disagree on North Korea. South Korean President Moon Jae-in says he wants to use the meetings with North Korea officials during the Olympics as a starting point for negotiations, WashPost reports. "On the Korean Peninsula issue, Han said the situation on the peninsula is undergoing positive changes recently as South Korea and the Democratic People's Republic of Korea (DPRK) have taken the opportunity of the PyeongChang Winter Olympics to restart dialogue and commence cooperation, adding that the relationship between the two sides has been improved and seen progress." "is willing to maintain communication and coordination with China to push forward the inter-Korean dialogue facilitated by the PyeongChang Winter Olympics, to settle the peninsula issue through peaceful means and to achieve sustainable peace and prosperity in the region," per Xinhua. Back in D.C.: China's top diplomat Yang Jiechi met with Secretary of State Rex Tillerson Thursday and said that "the international community should support the improvement in relations between North and South Korea," Reuters reports.